Did you know that an interesting alternative to the racetrack in Baden-Baden/Iffezheim (Germany) exists in Alsace? You can watch exciting horse races in the small town Hoerdt as well. 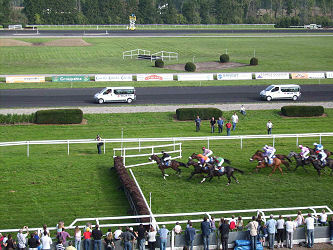 The racetrack (hippodrome) of Hoerdt, only a few kilometres away from Strasbourg, is one of the most visited in France. Since 1970, fans of equestrian sports watch high-quality horse races and bet for their favorites. The entrance fee for adults only costs €5, for children and teens up to 18 years, the entrance is even free. A big, free car parking is just next to the racetrack. You reach it for example via the A35 in direction Strasbourg, exit Hoerdt. Would you like to visit France and watch the horse races in Strasbourg-Hoerdt? We recommend you the following hotels and accomodations if you would like to stay for the night or if you would like to stay in Alsace for several days. Before the race: Which horse is the most impressive? Bet on the winner of the horse race. The horse has to be the first, second or third. If there are less than eight horses, it has to be the first or the second to arrive at the finishing line. The correct order of the first and the second horses arriving at the finishing line has to be predicted. The first three horses have to be predicted in the correct order. The first four horses have to be predicted in the correct order. Bet on two horses that have to be the first, the second or the third in any order. The first horses of the last three horse races of the day have to be predicted. The first horses of the six races of the day have to be predicted. The horse should be the first or the second. The horse should be the first, the second or the third. Those bet forms can be combined, for example as WinPlace. The winners of three successive horse races have to be predicted. The winners of four successive horse races have to be predicted. The winners of five successive horse races have to be predicted. The winners of six successive horse races have to be predicted. Horse racing in France/Strasbourg-Hoerdt: Endless fascination! In France, about 16,400 horse races are organized every year on 2,450 racetracks. 56,000 of the 215,000 horses coming from the ten European countries participating in horse races come from France. Did you know that France has more horse racetracks than all other European countries together? The Franch state and the equestrian sports organizations earn more than one billion euros every year. Exclusively the bet turnover is over 6 billion euros every year. The horse race organizations are organized in 10 regional alliances, for example the Eastern Federation (Fédération de l'Est). In this alliance, eight horse race societes are organized. They organize 74 horse races with 70,000 spectators annually. Three racetracks playing an important role in France belong to this alliance: Nancy, Vittel and Strasbourg. In Alsace, there are two horse race societies: Wissenbourg and Strasbourg. Exclusively in Alsace, there are 19 events with about 150 horse races every year. Traditionally, spectators go watching the horse races in Wissembourg on Whitsun Monday. However, the racetrack in Strasbourg-Hoerdt is the most visited in eastern France. There are about 16 race events every year and the Société des Courses de Strasbourg is one of the most important in France. From 1924 to 1939, the horse racetrack of Strasbourg was located nearby the Rhine Bridge where we find today a centre for water sports. Already in 1960, a new racetrack should be constructed near Obernai, but in 1967, they decided to build it in Hoerdt. The construction began in 1969 and on September 6th in 1970, the new racetrack of Strasbourg-Hoerdt was inaugurated. In 1976, the stand was modernized and in 1990, the Société de Courses de Strasbourg celebrated its 20th anniversary with a visitor record. Today, the racetrack in Strasbourg-Hoerdt is an international meeting point for gallopp races and obstacle races. The races take place between March and June and between September and November. Prize moneys of about 1.3 million euros are given every year. Hoerdt is about 10km in the North of Strasbourg and about 20km in the South of Haguenau. It is located near the motorway A4 (direction Paris) and the motorway A35 (direction Lauterburg and Germany). The access to the racetrack is very easy.